There are no items with the characteristics you specified. Please, select other options. Sign up for our newsletter and get and be the first to check out our lastest news, tips and offers. Cookies help us gather data temporarily for analytical and promotional purposes in order to give you a more tailored online experience. Os artigos assinalados com esta etiqueta estão disponíveis nos nossos armazéns e serão entregues na morada pretendida pelo cliente no prazo máximo de 48 horas. - Todos os artigos do pedido devem, estar assinalados com 'Entrega até 48 horas'. - Este serviço apenas está disponível para pedidos com entrega em Portugal Continental. - Os artigos serão entregues até 48h após recepção do email de confirmação de pagamento. Para mais informações consultar as condições de pagamento. - Este serviço não está disponível para pedidos efectuados aos Sábado, Domingos e Feriados. - O Prazo de entrega em 48 Horas é válido, salvo ruptura de stock. - Na página de confirmação de pagamento do seu pedido deverá verificar o prazo. 2BStyle.net uses automated data collection systems, such as cookies. A cookie is a small amount of data sent to a user's hard drive with information relating to the user's navigation on the Platform; its main purpose is to make browsing easier. Even though cookies do not contain any intelligble information, they allow us to link an Internet user to his/her personal information. Cookies are sent by our servers and nobody has access to the information they contain. Only 2BStyle.net can access the information collected by cookies collectively and anonymously in order to optimize its services and those of this site within the scope of the user's needs and preferences, and to ensure web pages presented are personalized. If you choose to configure your browser to block and/or delete cookies, please be advised that we cannot guarantee that you will have access to all the resources and services offered through the site (for example, your computer may not be able to display the image of the item you are trying to purchase). Internet Day: FLASH SALES every 3 hours! From 8h00am to 10h59am: 25% off Shirts and Tunics Lanidor Woman/Kids, Globe, Throttleman; 30% off Shirts and Tunics Quebramar. From 11h00am to 1h59pm: 30% off Dresses and Skirts Lanidor Woman/Kids, Globe; 25% off Dresses Throttleman; 20% off Shorts Throttleman; 25% off Dresses and Skirts Quebramar. 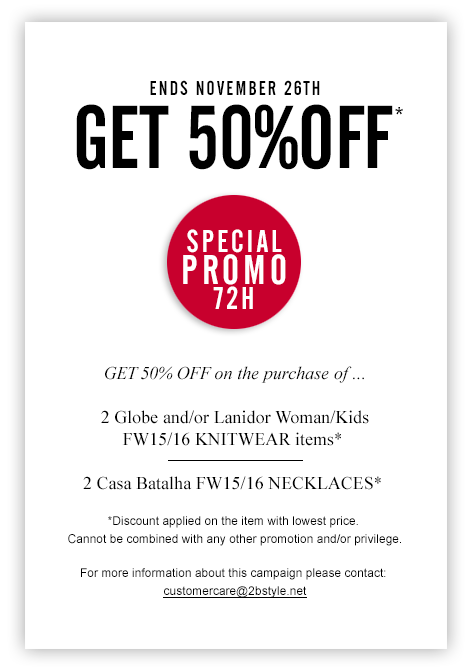 From 17h00pm to 7h59pm: 25% off Accessories Lanidor Woman/Kids, Globe, Quebramar; 25% off Pants Throttleman. Get 20% off All Pablo Fuster and Casa Batalha SS'18 Collection. Promotions valid on SS'18 items on May 17 until 11h59pm (GMT +1). Cannot be combined with any other promotions and/or benefits.